While Monday featured spring-like temps in the 60s and 70s, winter returns Tuesday and Wednesday. HOUSTON — Many here are thankful that we miss the worst of the arctic blast set to bring widespread sub-zero temperatures to the Midwest this week. Lows there will dip to past -30°F in parts of Minnesota and the Dakotas. 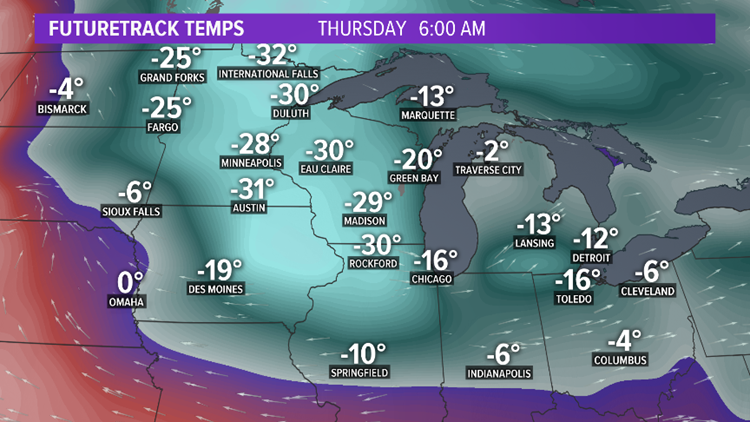 Wind chills there could surpass -50°F in what will be hands-down dangerous cold. (Exposed skin can freeze in those conditions in just a few minutes!) Residents there will no doubt remember this cold wave for years. The same system will push sharply colder temps into our region of southeast Texas starting Tuesday 1/29, with readings falling some thirty degrees in just 12 hours, but it won't be nearly as cold as areas 800 miles north of us, where the sub-zero line develops. Lows will not even fall below freezing here, but thanks to gusty conditions, wind chill readings will fall below freezing. You won't need to cover plants (since the true temp will be above freezing), but you will need a heavy jacket and winter hat at the bus stop, or on the way to work tomorrow. 7 AM TUE 1/29 - 36° Wind chills in the 20s!